Firstly, let me apologise for my lack of posts, though i don't work, i've actually had a lot going on, physically, emotionally and mentally, but i'm not going to bore you with the details. Secondly, though the photos are in good quality above, the sun was shining so brightly on the day that they were taken, so there are little sun dots on the photo that i can't tried to edit out and failed miserably. But anyways. 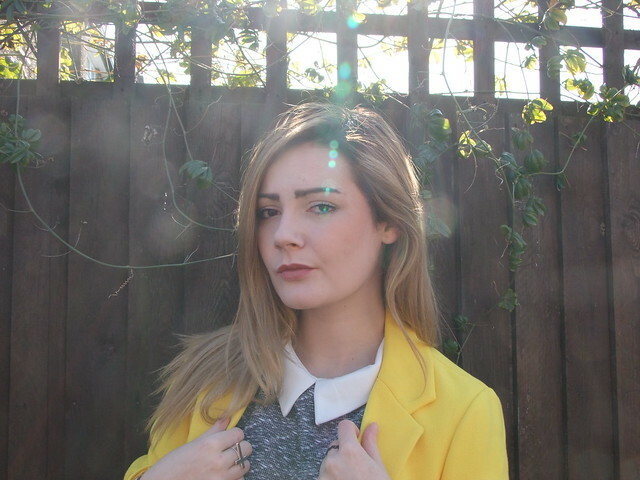 I bought this gorgeous yellow coat in the New Look sale a few days ago, tried it on and fell in love. 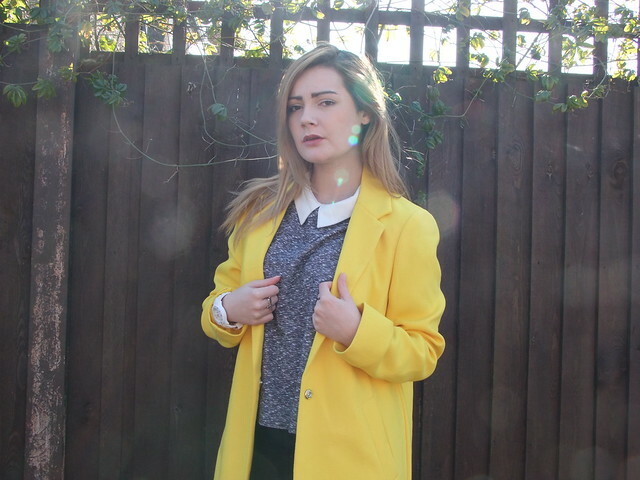 Originally the coat was priced at £40, and it was reduced in the sale down to £12! What an absolute bargain!! The coat is quite smart, and was the perfect size, not too tight or too big, so it's something i will be wearing quite a lot when the weather gets a bit nicer here in England. I'm also wearing a greyish collared top, with a black tube skirt. I thought i'd keep the colours under the bright coat quite understated to draw more attention to the coat, then the rest of my outfit. I love my collars at the moment though, and the brand Cameo Rose at New Look, just appeals completely to my style, i've bought majority of their range that's in stock at the moment! 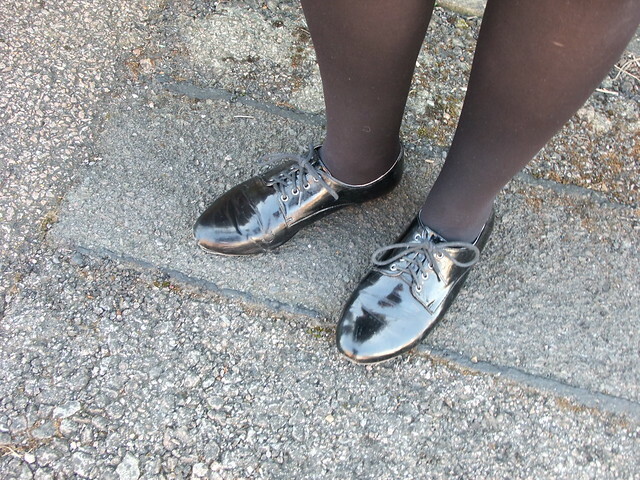 I'm wearing my trusty brogues which are as comfy as ever despite being quite tatty. I really should start wearing my newer ones, but the whole blister phase just doesn't appeal to me. I'm also loving my white Ice Watch lots too at the moment. I got it for Christmas this year, and though i'm not much of a watch wearer, i loved the look of this one, and now i can't take it off. That coat lady! It's amazing! What a great bargain on a lovely coat! I love the yellow colour. Those New Look outfit pieces look lovely styled together. Your hair, lipstick and mascara all look pretty. I hope you feel better physically and emotionally and that you have a wonderful Spring! P.S. : I post less often than you do.